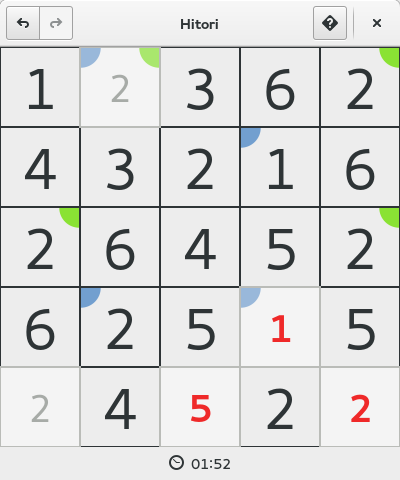 Hitori is a small application written to allow one to play the eponymous puzzle game, which is similar in theme to more popular puzzles such as Sudoku. It depends on GTK+ 3 and Cairo 1.4, and has full support for playing the game (i.e. it checks all three rules are satisfied). It has undo/redo support, can give hints, and allows for cells to be tagged with one of two different tags, to aid in solving the puzzle. It has support for anything from 5×5 to 10×10 grids. You can get Hitori from flathub. Bugs should be filed in GNOME GitLab.